Imagine controlling a market so thoroughly that you could short it endlessly, whenever you wished, and wait for buying demand to wane enough so that the price dropped from there. And then, when it had dropped sufficiently to your liking, you could cover your short profitably, and then buy, endlessly, until selling pressure abated and you let the price drift up from there. Lather, rinse, repeat, ad infinitum. Welcome to JPMorgan silver trade. In many circles, this process is known as “market manipulation”. But on Wall Street, this is often known as “a day’s work”. 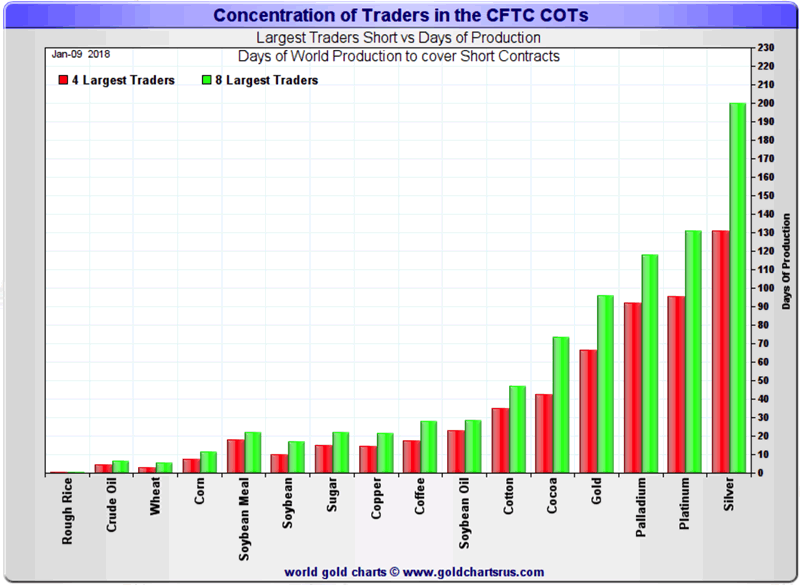 Our own Mike Maloney has broken down on numerous occasions how gold and silver price manipulation works. In effect, companies, organizations or governments make a purposeful effort to control prices, either by artificially inflating or deflating them. There are numerous stories of this happening in the commodities market — perhaps the most famous one in recent history was “Silver Thursday” when the billionaire Hunt brothers tried to corner the silver market. But an even bigger one has been developing since 2008 when JPMorgan acquired Bear Stearns and thus became the biggest beneficiary of the COMEX silver fraud. In short, so to speak, JPMorgan has brought a new meaning to the term “owning silver”. The most powerful back on Wall Street now owns the largest supply of physical silver in the world, with more than 700 million ounces locked away. And the time is coming when they’re going to let the artificially repressed price begin drifting upward. And ironically, their silver market manipulation has made it a better time than ever to invest in silver — or what’s left of it — so you can take advantage of the same price boom. A year ago, I took the occasion of new appointments at the CFTC as an opportunity to try once again to persuade the agency to step up to the plate and address a silver manipulation that had been in place for more than 30 years. James McDonald was the newly installed Director of the Enforcement Division. I made the letter I wrote public. I made special note in my letter to McDonald of the role JPMorgan played in the silver manipulation since acquiring Bear Stearns, including that JPMorgan had never taken a loss, only profits every time it added new short positions in COMEX silver futures over the past ten years. Such a perfect trading record would be impossible in any market that wasn’t manipulated. In addition to JPMorgan never losing, only winning whenever it added COMEX short positions, the bank had accumulated a massive amount of physical silver at prices it was responsible for depressing (by the way, JPM has added 100 million physical ounces over the past year and now holds 700 million oz.). In hindsight, I wouldn’t change a word of what I wrote a year ago. I never heard anything from the agency or McDonald and don’t expect to. Regardless, I thought it might be instructive to see what transpired in the year just passed, with close attention to my allegations that JPMorgan had never taken a loss, only profits, by shorting COMEX silver contracts. How did JPMorgan fare over the past year – I mean aside from the bank adding another 100 million physical oz on the cheap? JPMorgan not only maintained its perfect trading record, it did so in absolutely spectacular fashion, with the past year being perhaps its best year ever in trading silver. On ten separate occasions, starting with McDonald’s first day on the job, JPMorgan managed to either add a significant number of net new COMEX silver shorts as silver prices rose or buy back those added shorts at a profit, never taking a loss.